Choose from our selection of blank note cards featuring many of Henrys most popular wildlife and landscape images. These 5x7 cards come as a box of 12 with envelopes. Our holiday cards represent images that convey the colors and mood of this special time of year. Each card is printed inside with the message Seasons Greetings. 12 cards to a box with envelopes. Any of our images may also be purchased as a 5x7 Mini Print. 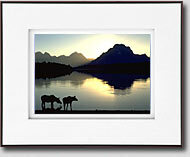 Each mini print is shadow boxed in a white double mat and placed in a thin metal frame. These mini versions of our favorite prints make great gifts.